Companies can give promotion to existing employees. This method of recruitment saves a lot of time, money and efforts because the company does not have to train the existing employee. Since the employee has already worked with the company. He is familiar with the working culture and working style. It is a method of encouraging efficient workers. Departmental exam :- This method is used by government departments to select employees for higher level posts. The advertisement is put up on the notice board of the department. People who are interested must send their application to the HR department and appear for the exam. Successful candidates are given the higher level job. The method ensures proper selection and impartiality. Many companies adopt transfer as a method of recruitment. The idea is to select talented personnel from other branches of the company and transfer them to branches where there is shortage of people. Many companies call back personnel who have already retired from the organization. This is a temporary measure. The method is beneficial because it gives a sense of pride to the retired when he is called back and helps the organization to reduce recruitment selection and training cost. In this method vacancies in a particular branch are advertised in the notice board. People who are interested are asked to apply for the job. The method helps in obtaining people who are ready to shift to another branch of the same company and it is also beneficial to people who want to shift to another branch. Employee recommendation :-In this method employees are asked to recommend people for jobs. Since the employee is aware of the working conditions inside the company he will suggest people who can adjust to the situation. The company is benefited because it will obtain. Internal methods are time saving. No separate induction program is required. The method increases loyalty and reduces labour turnover. This method is less expensive. There is no opportunity to get new talent in this method. The method involves selecting people from those available in the company so there is limited scope for selection. There are chances of biased and partiality. Chances of employee discontent are very high. Management consultant helps the company by providing them with managerial personnel, when the company is on the look out for entry level management trainees and middle level managers. They generally approach management consultants. Companies may give a contract to employment agencies that search, interview and obtain the required number of people. The method can be used to obtain lower level and middle level staff. When companies are in search of fresh graduates or new talent they opt for campus recruitment. Companies approach colleges, management, technical institutes, make a presentation about the company and the job and invite applications. Interested candidates who have applied are made to go through a series of selection test and interview before final selection. This is one of the oldest and most popular methods of recruitment. Advertisements for the job are given in leading news papers; the details of the job and salary are also mentioned. Candidates are given a contact address where their applications must be sent and are asked to send their applications within a specified time limit. The method has maximum reach and most preferred among all other methods of recruitment. With increasing importance to internet, companies and candidates have started using the internet as medium of advertisement and search for jobs. There are various job sites like naukri.com and monster.com etc. candidates can also post their profiles on these sites. This method is growing in popularity. 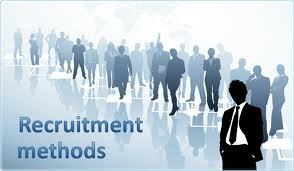 Another method of recruitment which is gaining importance is the walk in interview method. An advertisement about the location and time of walk in interview is given in the news paper. Candidates require to directly appearing for the interview and have to bring a copy of their C.V. with them. This method is very popular among B.P.O and call centers. There is influx of new talent in the method. The method encourages more and more competition. There is lesser chance of partiality through this method. If options like campus recruitment have been exercised we get a chance to employ fresh graduates, thus increasing employment. The method is costly because it involves recruitment cost, selection, training cost. The method reduces loyalty to the company.